Most tobacco, corn, and soybean growers have either just planted or are planning to plant within the next week. But with the recent heavy rains that have soaked the mid-Atlantic and Southeast US, growers are faced with challenges that could ultimately affect their yields and harvests later this summer and early fall. Using WDT’s WeatherOps Insight API, I was able to look up some rural areas where corn, tobacco, and soybeans are grown in the Carolinas and Virginia. 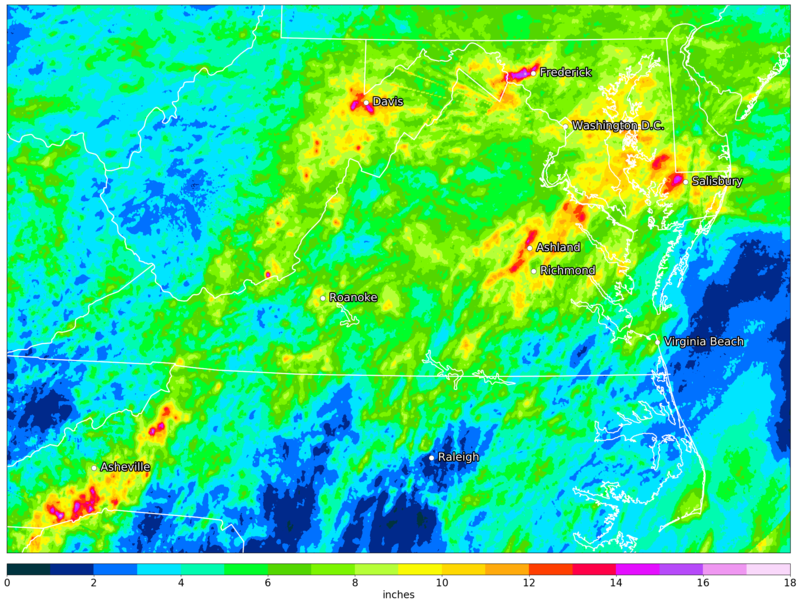 Data show that some locations in central and northern Virginia and western North Carolina have picked up close to a foot of rain so far in May, and many areas in the mid-Atlantic and southeast US are seeing well above average rainfall totals over the past two weeks. This WDT MetStorm Rainfall Accumulation map shows multiple locations have had over 12 inches of rain along the Appalachians from Georgia up through West Virginia. While rains after planting are always welcome, it’s preferred in moderation and not a deluge, as has been seen over the past week. Most crops are either still right at or below ground level, and heavy, prolonged rains can cause many issues for crops this early in their growth stages. In flooded fields with standing or ponding water, growers can experience nitrogen, potassium, and sulfur leach from the soil. After two days of standing water, the oxygen supply in the ground is depleted, and without oxygen, the plant cannot perform critical life-sustaining functions. Nutrient and water uptake is impaired, and root growth is inhibited. These effects will ultimately affect the final crop yield at harvest. How much yield will be impacted is still yet to be determined. We have several months for the crops to make up for lost ground, but the critical root growth stage that happens within the first few weeks of planting is being heavily inhibited by the recent flooding rains, causing significant concerns for growers in this area.